When the U.S. Ambassador to Qatar, Joseph LeBaron, first arrived as a diplomat to the Gulf in 1980, many of the region's nations had newly formed, and citizens still lived hard, nomadic lives. By virtue of their natural resource wealth, these countries transformed rapidly, and today attract talent from across the globe, while investing billions into development and infrastructure, education and innovation. 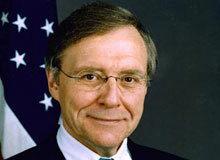 LeBaron, whose diplomatic career includes serving as the U.S. Ambassador to Mauritania, has unique insight into the Gulf, having witnessed its speedy societal development. Still, even he acknowledges being caught unawares by the Arab Spring's affect on the region. Now finishing over three decades with the U.S. Foreign Service, LeBaron, speaks with Arabic Knowledge@Wharton about the tumult and changes in the Middle East wrought by the Arab Spring. The unrest has shown that Palestine is not the central political concern for all Arabs, he notes. One of the challenges raised by the unrest that bears close attention, LeBaron adds, is how to translate the youth-fueled civil society under development in cyberspace into a new feature of civil society in the Arab world's physical space. Arabic Knowledge@Wharton: From governments toppled in Tunisia and Egypt to even the death of Osama bin Laden, all the changes affecting the Middle East would have been considered unthinkable just a few months ago. Can you account for this rapid succession of events? Ambassador Joseph LeBaron: Middle East specialists knew that the conditions for such a series of events existed — the youth bulge, unemployment, poor governance — and that these conditions had existed for some time. But we did not know when those conditions would lead to popular unrest, and we did not know what that unrest would look like; that is, who would lead it, and who would participate in it. In a way, it was like trying to predict when an earthquake will occur. You might know that the tectonic conditions are in place for an earthquake, but you cannot know with any precision when the earthquake will occur. Accordingly, I think that, while most people were surprised in one sense — by the timing, by the rapidity of the spread of unrest– they were not surprised in another sense that the events occurred. I was particularly surprised by the rapidity with which the unrest spread, and by the depth of the change that the unrest produced. It happened so quickly in Tunisia and Egypt! The consequent change has been structural. The Middle East is not going back to the status quo ante. The Arab Spring is precisely that: the start of a long, uncertain path toward structural change throughout the Middle East, in politics and in governance. Arabic Knowledge@Wharton: Was there anything you saw beforehand that indicated the Arab Spring would begin? LeBaron: I didn't see it coming. I knew that domestic political, economic, and demographic tensions existed in the region. For example, youth unemployment was a persistent problem, aggravated by the youth bulge. Sometimes such conditions lessen through economic growth, sometimes through changes in government or in governmental policies. There are a number of variables associated with these domestic tensions. But I, for one, certainly could not predict or project the occurrence of this series of events. I could not because I did not know when these tensions would unleash the social and political forces necessary to produce the outcomes we saw. Arabic Knowledge@Wharton: But most of the demographic and economic issues spurring the Arab Spring have been long-standing. How is it that one incident in Tunisia could inflame the entire region? Why would all this happen right now? LeBaron: Personally, I think technological change was an extremely important, direct variable in the Arab Spring. By that I mean the technology necessary to organize and to spread information in real time, at the level of the individual, across political and geographic boundaries had become available. That technology — social media — coupled with the conditions that you just described, account for it, in my opinion. There was an ability to communicate quickly, individually, and widely, that didn't exist three or four years ago. Arabic Knowledge@Wharton: What myths about the Middle East has the Arab Spring dispelled? LeBaron: I think that the biggest myth is the centrality of the Palestinian-Israeli issue to the region. What we saw, first in Tunisia and then elsewhere, was extraordinarily revealing: Arabs focused on Arab issues in Arab states without reference to the United States, or Israel, or foreign policy. The focus was not outward but inward, on governance, the relationship between government and its citizens, on domestic reform associated with government, social justice, human rights, and the freedom of expression. That was extraordinary. For decades, the assumption both inside and outside the region has been that the key to peace and stability in the region was a solution to the Palestinian-Israeli issue. But what 2011 has showed us is there are other issues of structural importance to peace and security in the Middle East. Of course, there's great interest in the Palestinian-Israeli issue throughout the region. But the region moves in response to things far beyond this single issue that so convulses the Levant. If you look at the region, from Morocco to the Gulf, you'll see that other important forces are at play. We cannot ignore those. Arabic Knowledge@Wharton: What are your thoughts on what's next for social media in the Arab world? One suggestion is that it will become a regional public square mostly beyond the reach of authorities, creating a parallel political and social conversation. LeBaron: I agree with that. We in the West naturally tend to look at Arab societies as a mirror image of ourselves. That is, we judge the strength or weakness of civil society on whether or not the kinds of institutions that exist in our civil society exists in theirs. If and when we don't find those institutions, we conclude that Arab civil society is weak. That's mirror imaging, and it is an analytic weakness. In the Gulf and elsewhere in the Arab world, there exists a majlis system. In this feature of Arab civil society, people gather nightly, several times a week, or weekly in different homes. At the majlis, they often discuss issues of the day, ranging from politics to business to social affairs. I don't think there is anything quite like it in the West. It is an entrenched aspect of Arab civil society that has existed for a long time, especially in the Gulf. And Gulf leaders make a point of keeping up with the popular concerns expressed through the majlis system. Now, in addition to the majlis system in the Gulf, for example, a new public forum is developing, one in cyberspace. But the question then becomes, how do you translate that civil society under development in cyberspace into a new feature of civil society in physical space? The answer to that question will have a direct and immediate impact on the Arab Spring, on extending the Arab Spring to other countries. The essential challenge for the youth-led revolutions that we saw in Tunisia and Egypt and elsewhere is to translate cyberspace communities into sustained, organized, politically active groups in physical space. Arabic Knowledge@Wharton: Could we have your understanding of U.S. policy perspective on these protests? Sanctions have been brought against Syria, and help provided to the Libyan rebels, but the U.S. stayed silent on the protests in Bahrain. LeBaron: U.S policy approaches the region country by country. It seeks to understand the circumstances in place in each country and to construct a policy response that promotes reform while protecting vital U.S. interests in the region. There is one common element in the U.S. position, though. That is the implacable opposition by the United States government to violence, whether by government or citizen. Arabic Knowledge@Wharton: What about this notion of Saudi Arabia pressurizing Arab countries to reconsider their relationship with the U.S., in the wake of the Arab Spring? LeBaron: Right now, I think that Arab governments in the region are focused on understanding the nature and extent of the indigenous demand for reform in their own countries, not on whether or not to reconsider their relationship with the United States. I believe the relationships these governments have with the United States will evolve, derivatively, from that indigenous, popular demand for reform. Clearly, that will be a long evolution, but we can already see evidence of that evolution in the region, starting in Egypt and Tunisia. If that derivative relationship exists, and I think it does, then I think the relationships that the U.S. has with Arab countries are gradually going to strengthen, not weaken. That is because the United States is on the right side of the reform issue, thanks to President Barack Obama's clear and forceful support for reform. Arabic Knowledge@Wharton: Most of the oil-rich Gulf nations are trying to reduce their economic dependence on natural resources. What's your sense of that transition and where you do see it going? LeBaron: Let me give you a 30-year perspective. Since I first came to the Gulf in 1980, I have seen the Gulf states pursue a pattern of growth that is leading, whether consciously or unconsciously, towards a highly ambitious goal: a renaissance of Arab and Islamic thought in science and technology. It's extraordinary, actually. The amazing thing is that both the resources and, increasingly, the vision are there to accomplish this renaissance. Several Gulf states are consciously trying to transition from hydrocarbon dependence to a knowledge-based economy — and society. In a way, that transition is an expression of something intrinsic to the history of the Arabs and of Islam. The transition underway in the Gulf is systemic. The Gulf is creating world-class educational institutions at the university level. There is an increasing level of sophistication in science and technology, in research and development, accompanied by a flowering of the arts. A cultural economy is gradually developing in the Gulf region as part of the systemic transition to knowledge-based economies. All this strongly suggests to me that what we see now in 2011, and what we've seen in the last 30 years, will continue in the next 50 years — irrespective of all the instability and the wars that have characterized the region. What's amazing to me is the strength of this pattern of growth towards this renaissance. Despite all the turmoil, the pattern is unbroken, at least in the Gulf. There is something very strong and very fundamental at work here, and I expect it to continue. Arabic Knowledge@Wharton: On the topic of education, a number of U.S. educational institutions have created a presence in the Middle East, particularly in Qatar. What do you think they are accomplishing? LeBaron: I think these U.S. educational institutions are bringing world-class education and training to a rising generation of Arab and Muslim youth. The immediate challenge to the institutions, at least in Qatar, is that the numbers still are small, relatively. The challenge, therefore, is one of scale. How will the institutions extend that great educational resource they represent on a scale needed to achieve the Arab and Islamic renaissance I see gradually emerging in the Gulf? I believe the answer to be this: Gulf educational institutions of higher learning must go beyond the indigenous populations of Gulf citizens to include the residential populations of non-Gulf citizens, and, eventually, to regional populations. I think this challenge of scale will ultimately be resolved as I have suggested. The educational institutions are here to stay, and their student bodies will grow in size as more and more students come to the Gulf to receive a world-class education in science, technology, and the arts. These students will stay to help develop Gulf economies and societies, and in a way that produces a flowering in the arts and sciences here. Arabic Knowledge@Wharton: Switching from education to corporate issues, what would you recommend to companies operating here that must balance government demands as opposed to the needs of their stakeholders? LeBaron: My recommendations would vary by country. That said, let me generalize by noting that there is a high barrier to entry, particularly for small and medium sized companies, in quite a few countries in the region. Knowing the business conditions; understanding how business is done; identifying a local partner; determining how to structure one's presence in the country — all are important and often difficult commercial steps. They are not simple and straightforward. The region can be a difficult, complex commercial operating environment, particularly for small and medium size enterprises (SME's). I certainly know our Commercial Office at the U.S. Embassy in Qatar does not advise small companies to begin their overseas activities with the Middle East region. There are communication problems as well. Perhaps counter-intuitively, faxes often are better and more effective than emails in eliciting responses from Gulf businesses. Also, English may be the international language of business, but written English can itself become a barrier to communication. Face-to-face meetings, which can be difficult and expensive to arrange, are nevertheless often well worth the cost. That suggests a local office is frequently necessary to achieve business success. Once you make that decision on presence, a whole host of decisions necessarily follows: how is your business presence to be structured, for example. Will it be a branch office or a representative office? With whom, if anyone, will you partner? Does it make sense to be in a duty free zone? There are several issues that must be addressed, and these often vary by country. The one approach I would strongly advise against is coming in angling for a quick sale and moving on. That is usually the wrong way to approach the Gulf. Establishing relationships, making a commitment to doing business in the country, and staying involved in the region are extremely important. The companies that I see coming to the region usually understand this; they have a quite realistic and knowledgeable approach to the region. I find U.S. business representatives to be an impressive group. Arabic Knowledge@Wharton: Let's discuss leadership then. What are some of the unique challenges of decision-making at your level? LeBaron: Ambassadors are responsible for managing and, where appropriate, deepening the relationship between two states — across the entire range of issues, whether those issues are commercial, military, educational, political, or cultural. One of the biggest challenges I have faced as an Ambassador is synchronizing in the host country the programs and activities of the Executive Branch of the United States. What I've seen over the years as a professional diplomat is a tendency towards uncoordinated planning and programmatic action in the Executive Branch. That lack of synchronized planning and operations at the tactical level can confuse and mislead host countries about the nature and intent of U.S. policies in the region. For the three years that I've been Ambassador in Qatar, therefore, I have focused on establishing Embassy synchronization groups to achieve the strategic goals and objectives of the U.S. government at the planning and programmatic levels. Arabic Knowledge@Wharton: How do you handle the pressures of public scrutiny or stakeholder pressure? What advice what you have others who are looking to be leaders in that space? LeBaron: Frequent, clear communication about your goals and your intent is key; a concise message often repeated in a variety of ways and venues. Carefully chosen themes and points, repeated so that people eventually internalize what you say. You need to have a clear sense of where you want to go and you need to communicate that direction clearly to others, identifying the shared interests that exist as you do.